For more than a decade, Judith Scott (1943 - 2005) was deeply involved in making large, colorful body-like sculptures out of found objects and yarn. Her works are abstract, dense, multilayered and, ultimately, a mystery, yet she could not tell us what they mean, or what inspired her to create these objects. Judith had Down syndrome, was deaf, and did not speak. These sculptures were her most complex means of communication. Judith spent thirty-five years institutionalized, with no creative outlet. Because of her deafness, she had been misdiagnosed as having an IQ of only 30; her parents were told that there was no hope of her ever accomplishing anything. 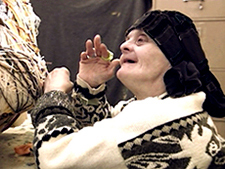 It was only when her twin sister Joyce regained custody of Judith in the 1980's that her creative life began to blossom, when Joyce brought her to the Creative Growth Art Center in Oakland, the country's oldest and largest community-based arts program for people with developmental disabilities. Today her work sells for thousands of dollars, and has captured the attention of collectors and museums worldwide. Though never fully aware of it herself, Judith had become a famous "outsider artist," and Joyce, who never forgot or gave up on her sister, had proven the power of love and family connection. From the studio where Judith created her sculptures to her group home in Berkeley, California; from the Ohio institution where she spent most of her life to the museums and galleries where her works are exhibited, OUTSIDER takes us on an intimate journey into the life of this eccentric, but talented and compelling individual who flourished in the face of daunting odds.